The demand for qualified Solar Technicians is rising, as more consumers and businesses apply solar energy in their communities. Many employers are requesting NABCEP (North American Board of Certified Energy Practitioners) certification or equivalent skills as a condition of employment. Amatrol’s Solar Photovoltaic Installation Learning System supports the learning necessary to prepare for portions of NABCEP certification and helps to prepare students for successful employment in the solar photovoltaic industry field. 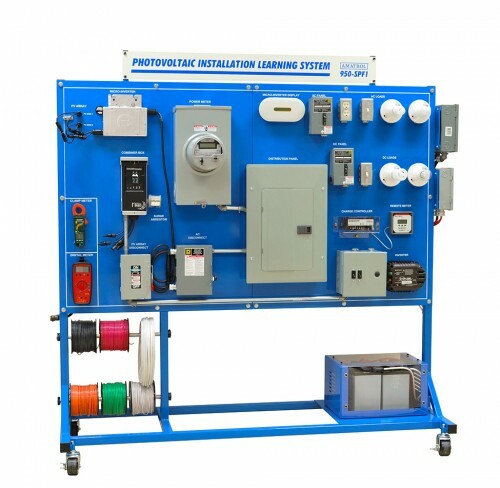 The 950-SPF1 Solar Photovoltaic Installation Learning System teaches students the installation and commissioning of grid interactive and stand-alone photovoltaic systems for commercial and residential applications. Students will learn how to develop and implement a site layout; calculate PV circuit voltage and currents; select and install wiring; and install real world components in PV systems, just as they would do on the job. The 950-SPF1 includes a mobile workstation with solar photovoltaic components, PC-based interactive, multimedia student curriculum; installation manual, and teacher’s guide. The mobile workstation is equipped with silkscreened labels for component identification; storage/inventory of clamp meter; digital meter; and storage for consumables, including wire and conduit, directly at the workstation. The 950-SPF1 provides a platform where students install real world systems using components commonly found in commercial and residential environments. Students identify and analyze sites for array locations; develop and implement a site layout; calculate PV circuit voltage and currents; choose, cut, strip, and connect wire; install real world components in a PV system; and install stand-alone and grid interactive PV systems, just as they would do on the job. These skills are part of the preparation process for getting NABCEP certification. This system has the unique ability to teach installation and commissioning of both grid interactive and standalone photovoltaic systems for commercial and residential systems. While grid interactive is the most popular PV application, both types of systems are common. The photovoltaic stand alone system is configured with battery backup; teaches DC to AC output (more popular) and DC to DC output, which continues to grow in popularity. wall outlet to workstation; DC Safety switch from battery to workstation; emergency stop pushbutton; and lockout/tagout.